This post may well change your life – I know it changed mine – and several other friends who I’ve already shared this with. The secret to this life changing experience is Ken Forkish’s new book Flour Water Salt Yeast: The Fundamentals of Artisan Bread and Pizza . 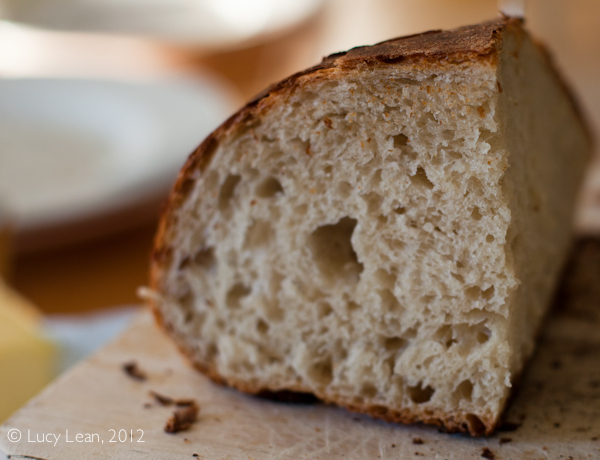 Here’s the best part – if you use organic flour and make bread from scratch it means your body can digest it more easily and it’s better for you than mass produced bread. Plus it tastes delicious. He’s the owner of Ken’s Artisan Pizza and Ken’s Artisan Bakery in Portland, and one of those passionate obsessive bakers – it seems to attract this personality type. Ask any good baker a simple question about dough and you should be engrossed in a fascinating discussion for hours. After just a couple of months of baking bread myself I can see how addictive and satisfying the process is. When I asked Forkish if he’d share a share a recipe in Made in America he generously sent me his recipe for Neopolitan Pizza – including the detailed recipe for the Overnight Pizza Dough – it came in at 7 pages and due to space issues sadly had to be cut from the book – a decision I bitterly regretted at the time and still do. Happily the recipe for this great pizza is in Flour Water Salt Yeast where it is given the pages and accompanying photos it deserves. Although I have here the complete recipe for the Overnight White Bread, I can’t stress enough how important it is to get the full experience by buying and reading Forkish’s book. It is full of step by step photos showing exactly how to make the bread in such detail that this recipe alone can’t give. 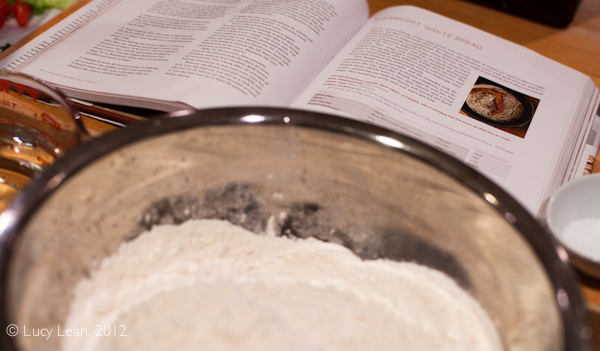 There are so many nuances involved in the bread making process that a single recipe can’t give you – plus you get the full Forkish back story in his book. His artisan journey took him from an office job to traveling Europe, enrolling at the San Francisco Baking Institute and even learning from the great Paul Bocuse in France, all part of his education, his mission and passion to become a great baker, in the old school tradition of the great, late Parisian baker, Lionel Poilane. I was so excited after my first bake. The loaf sat on the wire cooling rack singing to me as I waited for it to cool. The noise of the rich brown crust crackling as it cools and cracks is not to be missed. About 30 minutes out of the oven and still warm but not too warm, the real test was in the tasting. It was DELICIOUS! Soft, gentle flavors of the light airy crumb mixing with the rich crunchy crust. It really was on par with bread I have tasted in France – and I had made it using just four ingredients, a little time, a fabulous recipe and a great instructor. The family devoured almost the entire loaf in under ten minutes but I managed to save a couple of slices, made a little butter filled sandwich, wrapped it in wax paper and gave it to Charlotte at tennis. The very next day she was on Amazon ordering Flour Water Salt Yeast and all the equipment she would need to enable her to bake up loaves this good. I had jumped straight in, I started out by using regular bowls for proofing, removing the plastic knob from my Le Creuset, using my large stainless steel mixing bowl with plastic wrap to seal and even the thermometer from the medicine cabinet. What I’m trying to say is you really can make great bread with what you already have without a lot of fancy equipment, although the equipment will make the process easier and the loaves more professional looking. I have included links at the bottom of the post if you wish to buy the equipment. 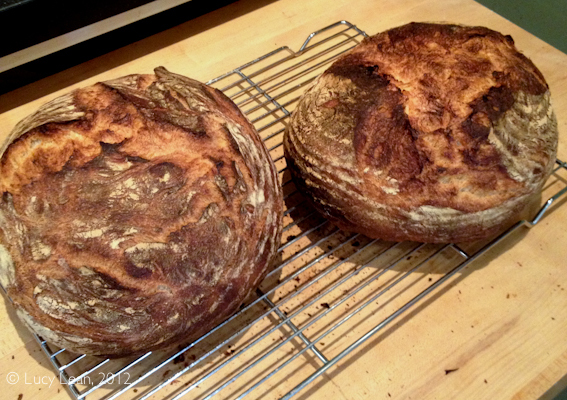 Although those initial loaves weren’t as pretty as the ones I now make using the proofing bowls they were just as tasty. 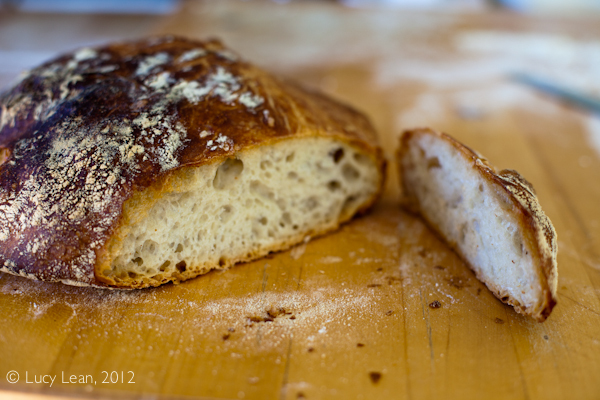 Reprinted with permission from Flour Water Salt Yeast by Ken Forkish, copyright © 2012. Published by Ten Speed Press, a division of Random House, Inc. The dark crust is beautifully crunchy – the darker the better to get that rich caramelized flavor and then the crumb is soft and light, a little chewy and a complex nutty flavor. I make this bread at least once a week for the family – and if I have an extra loaf it makes a great present to give to a friend. Always weigh your ingredients carefully and take the temperature of the water before adding it to the flour – you don’t want to kill the yeast by adding water that is too hot. The dough is mixed and folded by hand and then left to rise overnight, ready to bake at a high temperature in a Dutch oven. This recipe makes 2 loaves, each about 1½ pounds. Sample schedule: Mix at 7 p.m., shape into loaves at 8 a.m. the next morning, and bake at 9:15 a.m. The bread will come out of the oven a little after 10 a.m.
1. Autolyse Combine the 1,000 grams of flour with the 780 grams of 90°F to 95°F (32°C to 35°C) water in a 12-quart round tub or similar container. Mix by hand just until incorporated. Cover and let rest for 20 to 30 minutes. 2. Mix Sprinkle the 22 grams of salt and the 0.8 gram (a scant ¼ teaspoon) of yeast evenly over the top of the dough. Mix by hand, wetting your working hand in a bowl of warm water, before mixing so the dough doesn’t stick to you. (It’s fine to rewet your hand three or four times while you mix.) Reach underneath the dough and grab about one-quarter of it. Gently stretch this section of dough and fold it over the top to the other side of the dough. Repeat three or four more times with the remaining dough, until the salt and yeast are fully enclosed. Use the pincer method to fully integrate the ingredients. Using your thumb and forefinger, make five or six pincer cuts across the entire mass of dough. Then fold the dough over itself a few times. Repeat, alternately cutting and folding until all of the ingredients are fully integrated and the dough has some tension in it. 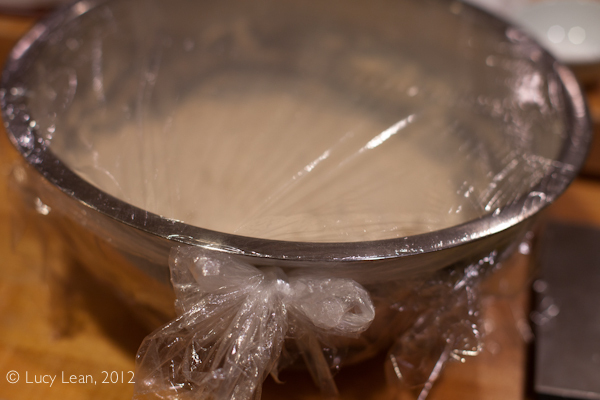 Let the dough rest for a few minutes, then fold for another 30 seconds or until the dough tightens up. The target dough temperature at the end of the mix is 77°F to 78°F (25°C to 26°C). Cover the tub and let the dough rise. 3. Fold This dough needs two or three folds (Fold by hand using a similar technique to the mixing, wetting your working hand in a bowl of warm water, before folding so the dough doesn’t stick to you. Reach underneath the dough and grab about one-quarter of it. Gently stretch this section of dough and fold it over the top to the other side of the dough. Rotate the bowl a quarter turn and repeat the fold action – do this 4 – 5 more times until the dough has tightened into a ball and invert in the bottom of the bowl, smooth rounded side up and seam side down). Three folds would be best for maximum gas retention and volume in the finished loaf, but if you only have time to do two folds it will be fine. It’s easiest to apply the folds during the first 1½ hours after mixing the dough. When the dough relaxes and spreads out in the bowl you will know it’s ready to be folded again. The more you fold the tighter the dough becomes as it develops structure and strength from the folding process. After doing the last fold, cover the dough and let it continue to rise overnight at room temperature. 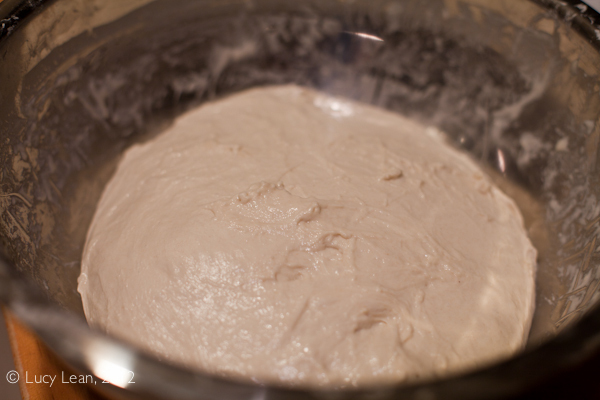 When the dough is 2½ to 3 times its original volume, 12 to 14 hours after mixing, it’s ready to be divided. 4. Divide Moderately flour a work surface about 2 feet wide. Flour your hands and sprinkle a bit of flour around the edges of the tub. 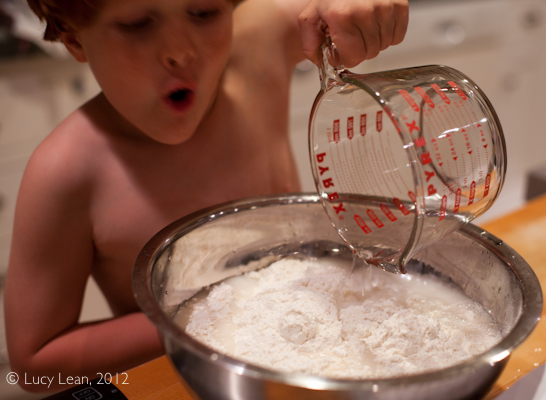 Tip the tub slightly and gently work your floured free hand beneath the dough to loosen it from the bottom of the tub. Gently ease the dough out onto the work surface without pulling or tearing it. With floured hands, pick up the dough and ease it back down onto the work surface in a somewhat even shape. Dust the area in the middle, where you’ll cut the dough, with a bit of flour. Cut the dough into 2 equal-size pieces with a dough knife or plastic dough scraper. 5. Shape Dust 2 proofing baskets with flour. Shape each piece of dough into a medium-tight ball using a similar technique to the folding action (this is where Flour Water Salt Yeast is really useful for showing you exactly what to do). Place each ball seam side down, smooth side up in its proofing basket. 6. Proof Lightly flour the tops of the loaves. Set them side by side and cover with a kitchen towel, or place each basket in a nonperforated plastic bag. Plan on baking the loaves about 1¼ hours after they are shaped, assuming a room temperature of about 70°F (21°C). If your kitchen is warmer, they will be optimally proofed in about 1 hour. Use the finger-dent test (when you push the dough in a 1/2-inch with a floured finger it should slowly bounce back – if it doesn’t push back it is over-proofed, if it springs back immediately it needs more time) to determine when they are perfectly proofed and ready to bake, being sure to check the loaves after 1 hour. With this bread, 15 minutes can make a difference between being perfectly proofed and collapsing a bit. 7. Preheat At least 45 minutes prior to baking, put a rack in the middle of the oven and put 2 Dutch ovens on the rack with their lids on. If you only have 1 Dutch oven, put the second loaf into the refrigerator about 20 minutes before baking the first loaf and bake the loaves sequentially, giving the Dutch oven a 5-minute reheat after removing the first loaf. Preheat the oven to 475°F (245°C). 8. Bake For the next step, please be careful not to let your hands, fingers, or forearms touch the extremely hot Dutch oven. Invert the proofed loaf onto a lightly floured countertop, keeping in mind that the top of the loaf will be the side that was facing down while it was rising—the seam side. Use oven mitts to remove the preheated Dutch oven from the oven. Remove the lid. Carefully place the loaf in the hot Dutch oven seam side up. 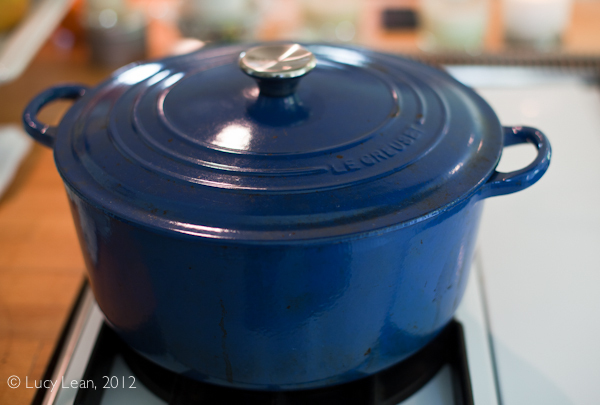 Use mitts to replace the lid, then put the Dutch oven in the oven. Maintain the temperature at 475°F (245°C). Bake for 30 minutes, (the crust will have a light brown color) then carefully remove the lid and bake for 20 to 30 minutes, until at least medium dark brown all around the loaf. Check after 15 minutes of baking uncovered in case your oven runs hot. Remove the Dutch oven and carefully tilt it to turn the loaf out. Let cool on a rack or set the loaf on its side so air can circulate around it. Let the loaf rest for at least 20 minutes before slicing. Enjoy the crackling sound of the cooking bread. 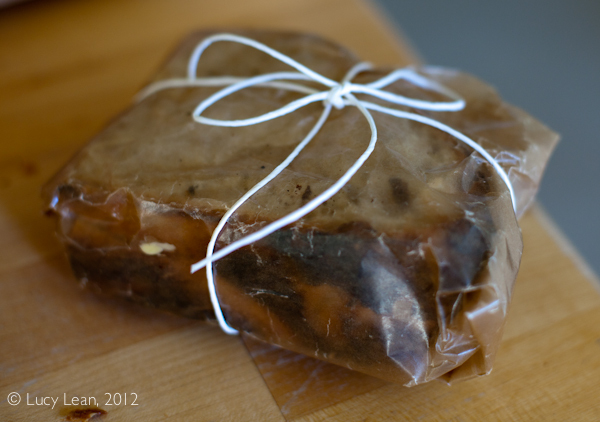 Place in a large plastic bag to keep fresh, the crust will soften but the bread won’t dry out. The bread will keep for 2 – 3 days. 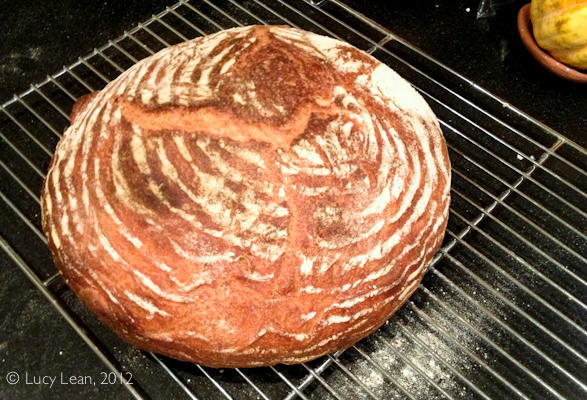 I have also had great success freezing the bread – I will slice it first, put it in a large freezer bag and then freeze. As I need bread I defrost a slice or two in the toaster on a low setting for soft bread and a higher setting for toast. 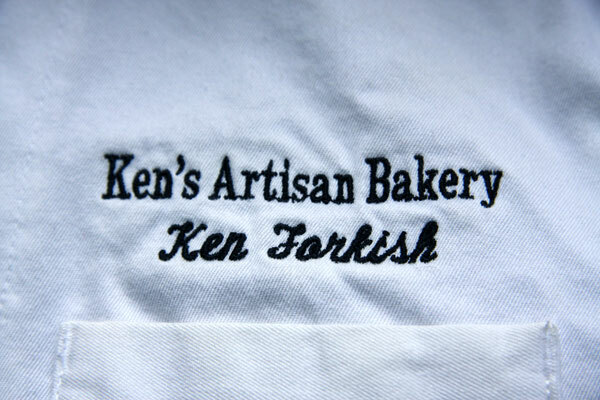 Thank you to Ken Forkish for his life changing book and for agreeing to share his recipe here – Ready, Set Bake! I have yet to make a GF bread that I like. 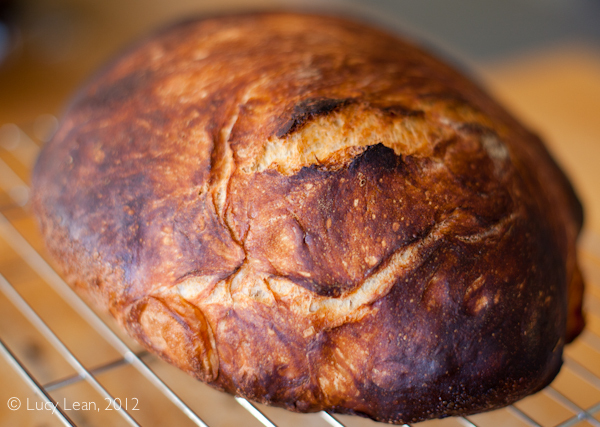 These look great and make me yearn to make delicious, fresh bread. I would love daily artisan bread too!